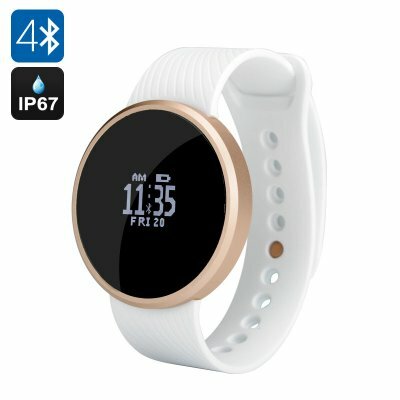 Successfully Added Bluetooth Smart Sports Watch - OLED Sreen, Pedometer, Remote Shutter, Call Reminder, IP67, Android + iOS (White) to your Shopping Cart. The sports smartwatch comes with a nice compact OLED display, IP67 waterproof rating, apps for Android and iOS, Bluetooth 4.0 support and lots of cool features. Stay fit and productive with a cool Bluetooth smart watch that comes with lots of great features! The touchscreen watch comes with an OLED display that is very easy to navigate and all your notifications and alerts will be immediately visible. The smart watch’s main functionality reveals itself once you hook it up to your smartphone - it comes with apps for both Android and iOS platforms. With Bluetooth 4.0, you will enjoy fast and smooth communication with your phone. What features will you have once the watch is hooked up? Glad you asked. First, you have lots of sports functionality. Use the pedometer to keep track of your daily activity. Bringing you a distance traveled reading and it can also give you a summary of calories burnt by the end of the day. The smart watch will also let you get timely alerts and notifications on your wrist: call reminder and message sync. It will also simplify your selfie-taking with the remote camera trigger feature and prevent your phone from going missing with the anti-lost function. With a 120mAh battery, the smart watch offers 30 days of standby time and can quickly charge via a USB cable. With IP67 waterproof rating, the water is dust tight and won't be damaged with water splashes.